With a strong endowment, Convent & Stuart Hall is able to invest significantly in the people, programs and place that inform a Sacred Heart education. Endowed funds create possibilities today and provide a revenue source to the school in perpetuity. These gifts activate new curricular programming, contribute to the financial aid and professional development budgets, and honor people from the community who have had a profound impact. Because the endowment improves the educational experience of students today and tomorrow, our gratitude is endless for the donors who contribute to these funds and generously initiate new ones. William Stuart Auchincloss Memorial Award is given annually in memory of Bill Auchincloss SHB’75. The award is presented to the 8th grade boy who best combines joy and responsibility with a zest for life. Christian de Guigne Memorial Fund transferred from San Francisco College for Women at Lone Mountain when the college closed in 1980. This fund provides support for religious studies in all schools. Continuing Faculty Excellence Endowment Fund honors and acknowledges the dedication of Convent & Stuart Hall faculty. General Endowment Fund was established by the Board of Trustees to ensure quality education at Schools of the Sacred Heart. This fund grows through gifts from supporters, through various special events, and through honorary and memorial gifts. Elvera Fusco Endowed Fund provides continuing support for faculty salaries and benefits. To recognize Ellie's lifetime commitment to education and excellence in teaching, the Fund also established three new annual employee awards named for Elvera (Ellie), her sister Mildred (Millie) and her brother Lorenzo (Larry). In 2018 an endowed fund was created to honor the Computer Science program and its integration with the humanities. The gift to establish the fund was made to honor long time Convent & Stuart Hall faculty member Doug Grant. Esther Rossi Award is given annually to an employee who is elected by his or her peers as an outstanding member of the community. Gordon Family Head’s Fund is for the discretionary use of Stuart Hall for Boys’ Head of School for special projects that are un-budgeted during the course of the year. Hearst Endowment Fund for Financial Aid was funded through “seed” grants from the William Randolph Hearst Foundation. This important fund serves as the foundation for our financial aid program. Mother Louise Williams Library Fund provides continuing support for Convent High School’s library through the acquisition of books and audiovisual equipment, as well as through developing our Archive and Technology Resource Programs. The Niehaus Family President’s Excellence Award is given annually to an employee at Schools of the Sacred Heart who shows exemplary excellence in educating our students and community, as chosen by the President of Schools. Earned income from the The Rosemary Cozzo Fund provides general support for the school as well as contributing to the “Launch Grants” awarded annually to students to research compelling new business ideas and help bring them to market. Salary Endowment Fund was created by the Board of Trustees, who are committed to maintaining faculty and staff salaries in the top quartile of Bay Area benchmark schools. Stuart Hall High School Founding Class Scholarship Fund was established in honor of the first high school class with the expectation that each graduating class would contribute to the fund. Sister Ann Conroy Award for Faculty Excellence named in honor of the Religious of the Sacred Heart who served as Director of Schools (1984-1994) and is given to a high school faculty or Central Services member working to achieve excellence in everything they do. Sr. Ellen Hoffman Endowment Fund provides for the continued purchase of library materials to serve both elementary schools. Syufy Family Endowment Fund was established by Marcia Syufy, grandparent, past parent and former trustee, to provide broad support and develop the endowment. Edward E. Ford Professional Development Fund allows Convent High School faculty to attend workshops, seminars and career conferences to further enhance their teaching. Elementary School Professional Development provides continued education and support for the elementary faculty. Eugene and Alma Mahan Fund for the Advancement of Convent High School Faculty Excellence enables faculty to attend educational programs, teacher workshops and special interest meetings. Sister Mary Mardel Fund for the Advancement of Elementary Faculty Excellence provides income for elementary faculty to attend programs that will enhance their teaching. Mark Ross Professional Development Fund in memory of Mark Ross by Stuart Hall High School past parents Annag R. Chandler and Victor Vitlin provides continuing education for faculty. 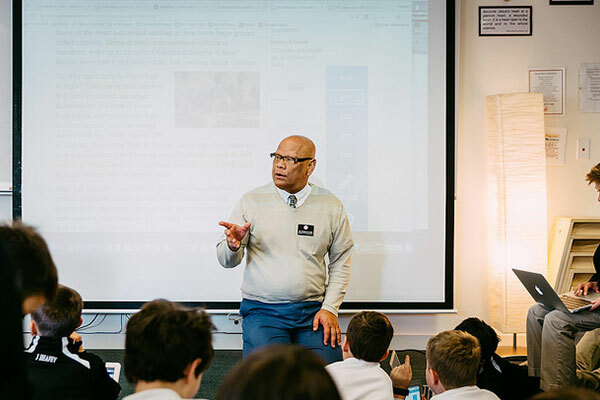 Mary Lee Casey Fund for Innovative Education provides opportunities for Convent & Stuart Hall teachers to attend course-related seminars and workshops. Anne Wachter, RSCJ Scholarship was established by Michelle Growney Syufy’84 and Joseph Syufy SHB’79 to honor the former Head of Convent Elementary, who has been a pillar of support to members of our community in times of crises. The funds are designated for K-8 students at Convent for whom there is a financial need as the result of a particularly challenging family situation or extenuating circumstances. Celeste O’Donnell Endowed Scholarship was established by the Board of Trustees and awarded for academic merit to Convent Elementary School students in need of financial assistance to honor Ms. O’Donnell, former head of Convent Elementary. Josephine D. Condon Endowment for High School Scholarships is given to young women who share a concern for others and who demonstrate their desire to become involved in the wider community. Edith MacLeay Grant Scholarship was established by Josephine Grant McCreery in memory of her mother and awarded to a student of Convent Elementary School. The former Grant home is now the location of the elementary school. Elena Rossi Long ’42 Scholarship was established to honor the Schools’ first Development Director. Founders/Cowell Scholarship was established by the S.H. Cowell Foundation and is awarded annually to a young woman who achieves one of the top 10 places on the high school entrance examination and who is in need of financial assistance. Whose purpose is to provide scholarship support for an elementary school student who is receiving more then 60% of her or his tuition in the form of tuition assistance. Gordon Sharafinski Scholarship was established in 2011 by an anonymous donor to honor the former Director of Schools and founding Head of Stuart Hall High School, who has educated young men in the Sacred Heart tradition inspiring leadership, scholarship and integrity. The funds provide the opportunity for a deserving student(s) to receive recognition for his accomplishments at Stuart Hall High School. Leo Hogan Scholarship was established by the Board of Trustees to honor the former Head of Convent High School. Dr. Mary Magnano Smith Scholarship Fund was created by the Board of Trustees in honor of Dr. Smith, Director of Schools from 1994-2000. Dr. Smith and the Board founded Stuart Hall High School so that young men could enjoy the same excellent Sacred Heart secondary education that has been offered to young women since 1887. Merrill Scholarship is awarded to minority students of the Roman Catholic faith. Miriam Gray ‘29’25 and Ann Gray Miller ‘62’58 Scholarship was established by Russell Miller and awarded to the daughter or granddaughter of a Convent High School alumna who is a current student. Sisters Olga 1911 & Aimee 1909 Rossi Scholarship was established by the Rossi Family to provide assistance to Convent High School students who exemplify Sacred Heart spirit. Oliva Scholarship was established by a parent of three Convent & Stuart Hall alumni with an expressed hope that the recipients, in the spirit of scholarship, will become future contributors to this fund and thereby help other fine students receive a Sacred Heart education. Broadway Alumnae Endowed Grant honoring Reverend Mother Deming provides scholarships for daughters and granddaughters of alumnae who wish to attend Convent High School. The scholarship is administered by the Broadway Alumnae of the Sacred Heart (BASH). Russell R. Miller Endowed Scholarship was established by Mr. Miller, Stuart Hall for Boys alumnus and former Dean of Students, for deserving Stuart Hall students. Ross Scholarship for Incoming Students was established by Gary Ross, a Sacred Heart New York parent, to assist families transitioning from public schools in the middle form to private school. Sophia Kent McNeil Endowment Scholarship Fund is awarded to an artistically promising student. Sr. Ellen Hoffman Scholarship was established by an anonymous donor to honor the 60th Anniversary Jubilee of Sr. Hoffman’s Final Profession. It is awarded to a Convent Elementary School student in need of financial assistance. Sr. Helen Carroll Scholarship for Stuart Hall was established in honor of the first Headmistress of Stuart Hall for Boys. This scholarship is awarded annually to a student who is chosen for his Christian leadership qualities. Sr. Mary Mardel Scholarship Fund was established by Sen. Dianne Feinstein’51 to honor Sr. Mary Mardel, her dedication and commitment to the students of Convent of the Sacred Heart. This scholarship benefits Sacred Heart high school students who attended the elementary school. Marcia and Richard Grand Endowed Summer School Scholarship assists families whose children attend summer school and are in need of financial assistance. Susan Chaban Memorial Scholarship was established by the faculty and staff of Stuart Hall for Boys in memory of the former school secretary. The recipient demonstrates an open and welcoming attitude toward his classmates and adults and an enthusiastic spirit consistent with the philosophy of Schools of the Sacred Heart. Thornton Scholarship was established in memory of Dr. Robert Thornton, a distinguished African-American college physics professor, valued friend and advisor to Schools of the Sacred Heart. This fund assists qualified minority students. Virginia Laib Conway ‘32 Endowed Scholarship was established by the 12 Conway children who attended Convent & Stuart Hall. This fund benefits any academically qualified student in financial need. The Hudson Gibson Fund for the Artist-in-Residence Program brings gifted artists to Stuart Hall to work with second grade boys, culminating in theatrical performances for students’ peers and families. This writing fund supports initiatives to enhance the creative and expository writing program at Convent Elementary, and to sponsor an annual award for writing accomplishment. In honor of the dedication of the chapel in the Flood Mansion being named for Mary Mardel, RSCJ, a fund was established to provide chapel upkeep and mission-inspired activities.